← Baby, it’s cold outside…. I don’t know if I love this story because of the name of the product: Hippo Rollers, or because it’s just so damn clever. Whatever, I’m hooked! Hippo Rollers were originally designed and manufactured by two men in South Africa fifteen years ago to facilitate the toting of water to villages without running water. Each Roller can carry 22 gallons of water — or five times as much water with the same effort– and since 15 million people in Africa don’t have adequate access to drinking water, its potential to improve lives across the globe is immense. After raising money to deliver 75 new Hippo Rollers to the rural community of Kgautswane, South Africa in 2008, Emily visited the manufacturing plant in Johannesburg and identified several design opportunities that could lower the price point and improve shipping efficiencies of the Hippos. Working with Engineers without Borders http://www.ewb-usa.org/ and another product design consultancy, D2M, http://www.d2m-inc.com/ Project H was able to develop a two-part capsule that could be stacked and nested for shipping, with an improved watertight seal. It’s 200% more efficient to ship and should work even better to allow people to carry water to their villages once a day, instead of making multiple trips. I love Emily Pillotin so much, I can’t stand it! She’s also got a beautiful, super cool book out called Design Revolution — 100 Products That Empower People. And she’s also teaching in North Carolina now … amazing person!! I’ll have to check her out. Thank you, again. This project kind of reminded me of a project at my daughter’s college, John Brown University. I can’t remember the details but it’s something like a generator they take to people in Guatemala. They do this as an entry into missions I think. Great idea! Do the locals invest in these Hippo Rollers or are they fully donated? 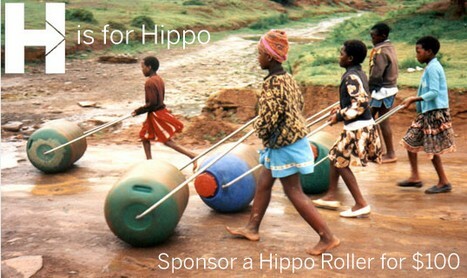 When Emily took the first 75 Hippo Rollers to the village in 2008, they were mostly all donated, I believe. The leader of the community– a powerful, wonderful woman — decided which families would get the Rollers. As far as I know (you can check more deeply into this on Project H’s website) they are being produced and sold through the South African firm which invented them. The price ($100) is the biggest obstacle — which is why I was investing in projects trying to reduce the cost of production, shipping and materials! Thanks for your interest!